My hubby has been organizing an event in our city called Fusion. 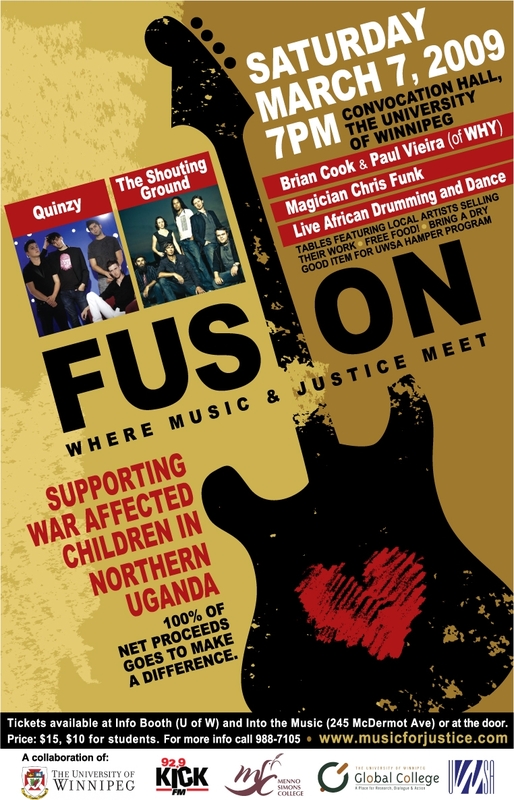 It's an evening of live entertainment to raise money for war affected children in Northern Uganda. The date of the event is March 7th. In the interest of raising awareness and letting the local crowd know about the event I'll be leaving this post up over the weekend and re-posting it next Friday as well. If you have the time come on out and support a great cause. Live bands are Quinzy, The Shouting Ground and an acoustic performance by my hubby and his band mate Brian of Why. You can find out more information here with a poster available for download. Hope to see you there!